Women bear multiple responsibilities at home and women play an important role in a wide range of income-generating activities, but their contribution to the national economy is largely unaccounted for. Long term monitoring and research is needed to have a full understanding of whether the current mitigating strategies of poor households, and particularly of women, are significantly or sufficiently contributing to adaptation to flood. The factors responsible for success or failure of these coping strategies may be relevant for future planning. There are some significant differences and similarities of findings between the two research locations in terms of mitigation and adaptation mechanisms practiced. Both the districts are extremely vulnerable to flood disaster, and getting major portion of their flood waters from two sources the river Jamuna and Padma. The topography, culture, poverty level, flooding characteristics and flood early warning dissemination are same in both the study areas. Although there are much commonality and differences in understanding and approaches of the coping mechanisms in the study areas, this understanding and approaches are disproportionately distributed in case age and gender. Mitigating strategies of women, are significantly or sufficiently contributing to adaptation to flood. The factors responsible for success or failure of these adaptation strategies may be relevant for future planning. Women are more vulnerable to flood for various reasons. To adapt with the flood mitigate the impact they have to maintain some strategies before, during and after the flood. The following are some of the micro-strategies used by women in Khorda Gajail and Bil Nuruddinpur village to adapt with flood and mitigate the impact of flood. Various steps are taken by surveyed household before the occurrence of flood to reduce risks that included raising homestead, storage of food and other essential household goods, and keeping livestock/poultry in safe place and fodder preservation etc. In Khorda Gajail and Bil Nuruddinpur mouza, vulnerable women have used their own science and arts to predict the flood. People have been traditionally doing their own flood forecast by looking at the behavior of the rainfall, water levels in rivers, direction of wind, color of cloud, unusual sound, celestial bodies or the behavior of snakes, frogs, ducks and other animals. This traditional tool is becoming of little help, however, due to the changing nature of disasters, leaving the community with no choice but to rely on whatever early warning system is in place. In Khorda Gajail and Bil Nuruddinpur mouza which families’ financial condition is better make boat for future transportation facility or to use during flood time. They also collect Banana tree before to make raft locally called “Vella” and sometimes they had to buy the tree from their neighbor. It is found 60.18% in Khorda Gajail mouza and 29.66% in Bil Nuruddinpur mouza. 66.95% women of the Khorda Gajail mouza prepare elevated structure locally called “Macha” (high wood or bamboo structures for storage) to keep essential items which are also used to protect goats and poultry from flood water whereas it is 60.16% in Bil Nuruddinpur mouza. Preservation of dry foods is very important before flood. Because in the crisis moment people can fulfill their nutrition need from food. 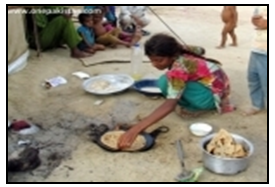 Women collect and preserve drinkable water and different kinds of dry foods such as- rice, peas, puffed rice, flattened rice, biscuit and molasses which is in Khorda Gajail mouza 53.38% and 31.35% in Bil Nuruddinpur mouza. These foods are put in a poly bag and stored either under the floor into earth or above their “macha”. Women often collect firewood to store in dry places for later use. The women in the study village store and use Cow dung, jute straw and paddy crust as alternative sources of fuel. Besides this they also store matches and kerosene for cooking. They prepare portable mud stoves and store cooking utensils for future use. 43.22% women preserve all these in Khorda Gajail mouza whereas 27.10% in Bil Nuruddinpur mouza. The experience women get from previous flood use to raise the plinth level of house. They raise the living place of cattle to protect them from flood. The homestead is also raise up to flood level. More financially secure households raise the level of tube wells. Around 63.55 percent in Khorda Gajail mouza and 45.76% in Bil Nuruddinpur mouza raised their plinth level of homestead. If nearby there have highland than the living house then more financially secure household established tube-well and latrines on high land away from living house so that water cannot enter into them. So they can collect pure drinking water during flood period. It is found 22.88% in Khorda Gajail mouza and 0% in Bil Nuruddinpur mouza. Before the flood season very low percentage of women collect and save money from a long time to use them at the time of crisis created by flood which is seen 58.47% in Khorda Gajail mouza and 22.88% in Bil Nuruddinpur mouza. Every one of the study areas women said that they repair their house which is very essential to save their houses from flood. Considering such facts and economic condition people now prefer to stay in houses made up thatched wall. Such type of house are safer and do not crumble down easily. The walls are not easily destroyed even if exposed to water. And on top of that the walls and roof are portable and can be reused if one wants to shift to other places. They fasten their roofs and pillars reinforcing wall with locally available resources and other materials according to their financial condition to make them resilient for flood. Women preserve several essential items before flood. They store ropes, different essential common medicine, and fodder for domestic animals, seeds, blankets and valuables on machas. They also store productive assets (i.e. ploughs, fishing nets) and other valuables under the soil to protect them from being washed away by flood. 72.03 % women of Khorda Gajail mouza store their essential item before flood whereas it is 50% in Bil Nuruddinpur mouza. The women in the study village conserve crops before flood. They practice some traditional system of seed and crop conservation which is 61.86% in Khorda Gajail mouza and 55. 08% in Bil Nuruddinpur mouza. They use some giant container which locally called “Gola” for conserving their crops for a longtime. They make thin and small special mat just for drying crops. Thus when rainfall comes they easily move the mat including crops, so the crops are not damaged in the rain water. Women are also expert in making Daheri (a mud depository for keeping food grains). The daheri are kept above a pihan, the mud platform. This help in keeping the food grains dry and hence help in preservation of food grains. Even though the people of the study areas have some knowledge about the different type of crops and other vegetables, they do not plant all these crops and vegetables looking at the weather and flood situation. Educating the younger generations about how to protect them has been a key strategy employed by households living in study areas. Teaching life-saving skills such as swimming and understanding flood signals are examples of how parents prepare their children. No formal mechanism for teaching children disaster preparedness exists, however; children usually learn from family discussions or meal-time conversations. Various other activities such as animal rearing, grazing and taking part in plantation work with their knowledge, are additional examples. Every woman of the study areas teach their children according to their education status and knowledge level. Children help their family in different works before the flood has come. Girl children specially help their mothers in the household works and boys children help their fathers in the outdoor works They take advice from the teachers to solve the upcoming situation. They store their books and study material in safe place. 35.59% of the respondent’s children of Khorda Gajail mouza help them whereas it is 65.25% in Bil Nuruddinpur. They discuss in a group which make them united to fight against the emergency situation. They discuss about what they will do in the emergency situation. Local community people participation is to mitigate and adapt with flood. These types of group discussion occurred in the Khorda Gajail before flood but people of Bil Nuruddinpur are not aware about this. During flood time mitigation the impact and strategies for adaptation is very important for flood affected women. This is the more risky and difficult time of flood and most unbearable time to pass. Women have taken different steps or do different works to adapt with flood especially during flood. During flood, every woman of the study areas constantly look after their children, elderly and disabled family members, and animals to ensure their safety. In flood-prone areas, women prepare elevated platforms for family members with disabilities, using the chouki (traditional bed) and bamboo. Often, to ensure that young children remain safe and are not carried off by flood water, parents construct a ‘fence-in’ to keep toddlers in one place. 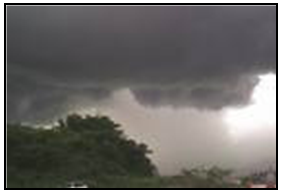 If a flood comes early in the monsoon season, it destroys the standing crop, which results in food shortages. When a household faces a food crisis during or after flood, women are responsible for adjusting household food consumption by changing the type of food eaten (instead of consuming rice, for example, they resort to alternate foodstuffs such as kaisha or kolmi, local vegetation,) or by consuming less. Often they collected food from neighbors to feed the family members. The food habit of the people changed during flood both in quality and quantity. Instead of three meals a day, at best they could manage two meals – that was true for those households who could manage an alternative source of income and took meals for the day. Those who could find a dry place and fuel, used to cook once a day and prepared meals for the day. Sometimes, they cooked for one day and took meals for two to three days. Dalia Begum, aged of 47 from Khorda Gajail mentioned that last year they faced a sudden flood, they were not prepare. She had a lot of troubles because she has a grandson only 3 year old; it was risk to fall into water. So she elevated her Chouki from flood level and save a place to sleep. She faced a lot of trouble with cooking. There was a crisis of fuel material. She also faced problem of drinking water because she had neither the physical strength to reach tubewells, nor the economic means to hire a boat. When flood water reaches the level of the livestock shed, people no longer keep their animals and other valuable assets at home. In some cases, they send their cattle to relatives. Some poor families try to sell livestock in an attempt to hold cash security, preparing against the possibility that regular income could be paralyzed and it is found 43.22% in Khorda Gajail whereas 72.03% in Bil Nuruddinpur mouza. It is found very low percentage to prevent fishes to wash way from flooded ponds by putting tree branches on the pond water surface. During flood women of the study areas had made drinking water safe through using alum (fitkiri), water purifying tablets (Halogen tablet). Drinking water from tube wells or river, in that case drink boiled water. Around 77.12% respondents of Khorda Gajail and 56.78% of Bil Nuruddinpur mouza purify their drinking water. In order to meet household financial needs, assets such as livestock, poultry and boats are often sold. Selling other valuables, mortgaging, or borrowing against assets, or borrowing from neighbors are other common strategies for survival. It is seen in 44.91% of women of Khorda Gajail and 67.79% in Bil Nuruddinpur. Many women in these areas are now part of microfinance organizations, using their memberships to access loans. Workload distribution within the family disproportionately affects women during flood. When husbands or male members become unemployed, daily work for women increases even more as they have to manage resources, feed the family and look after the elderly. In most cases, caretakers for people with disabilities are also female. Women have to do different household works and it is maintained by all the respondents of the two study villages. In Khorda Gajail mouza 31.35% women who have lost their working opportunity during flood prefer alternative livelihood options not to migrate as laborers; households that have boats, for example, earn incomes by ferrying people. Some even open small shops on the boats whereas it is found 56.78% in Bil Nuruddinpur. For earning during flood, they sometimes compromise with their values and dignity (i.e. begging) but the percentage of this is very low in the study areas. People of Khorda Gajail mouza who are affected by flood almost every year go to the flood shelter, school and on road when they have early warning information. They migrated there with their family and take livestock’s and valuable assets of them and the percentage of this is 37.29%. Because some time it become hard to manage space in the flood shelter that are late. Due to the absence of any flood shelter respondents of the Bil Nuruddinpur mouza go to the flood protection embankment under the open sky or making their temporary tent by polythene sheet or bamboo made roof locally called “Chatai” and the percentage of this is 66.10%. After flood mitigation and adaptation strategy is very essential for flood affected areas women. After flood, there is a long term effects like in difficulties in restoration of disrupted transportation and communication systems, difficulties in recovery of cultivated land damaged by flood and disrupted from settlements and through the overall disruption of socio-economic rehabilitation. 39.83% women in Khorda Gajail village and 60.17% in Bil Nuruddinpur village help to repair or reconstruct houses after flood with their own resources such as used plastic, jute sack and cloths to cover the rooms and roofs of their houses. They make temporary short canal beside their home for the expulsion of water. They repair latrines and clean houses and yard. Re-stocking livestock’s, animal husbandry, cow fattening and milking, goat farming, poultry rearing etc works are mainly maintained by women and girl children after flood which is 67.80% in Khorda Gajail and 60.17% in Bil Nuruddinpur. They also look-after their affected livestock’s which was injured during flood. Managing the fodder of livestocks, give their food gegularly and cleaning their staying places is mainly done by the women. Amena Begum, 31, said that after recent flood she moved from the flood shelter back to her house and had to repair her house. But it was very cost-effective for her family because they had no previous storage of money and her husband was workless. She had a goat and three hens, which died in the floods. So, she borrowed loan to again buy some livestoks. She started to grow homestead vegetation again and began to work in the field with her husband to support to her family. Women are traditionally observed a number of practices to adopt to flood, for example intercropping, mixed cropping, agriculture/post-harvesting, raising seedlings, agro-forestry, to cope with local flood. They also start again homestead vegetation or homestead gardening. They use rooftops and backward spaces to grow various vegetables and fruits. 38.13% women of Khorda Gajail are engaged with this types of works whereas 64.41% engaged in Bil Nuruddinpur village. A significant number of rural women, particularly from extremely poor landless households, also engage in paid labor in construction, earthwork and field-based agricultural work, activities that traditionally have fallen within the male domain to help the family after flood. 36.44% women do different outdoor works after flood to support her family financially. It is seen comparatively more in Bil Nuruddinpur village and the number is 51.69%. 49.15% women of Bil Nuruddinpur and 20.34% in Khorda Gajail take Loan from somity or borrow money, food from relatives to help the family members and also related with repaying borrowed money and securing an income . Food processing, cane and bamboo works, making fishnets and handicrafts related work to compensate of the flood and to help the family. Treated affected family members and restoring other aspects of life such as children’s education are all parts of recovery from flood. In all of these activities, women of the study areas are actively involved. Women use different local knowledge to mitigate the impact of disease. They made saline by sugar, salt and water and also collect ORS from different sources. Regarding awareness on diarrheal diseases, some women of the study areas response to the question on knowing about making Oral Saline, proper hand washing and water purification techniques. The lowest awareness on it found in Bil Nuruddinpur mouza and it is 29.66% and 57.63% in Khorda Gajail. Only few women and children have knowledge on. In all cases women and children in Khorda Gajail showed higher-level awareness on health and sanitation behaviors. In some condition they rely on the traditional health care practitioner like ‘Huzur’ (religious healing), ‘Fakirani’ (female faith healer) or the “Jhar Phook” (faith healing). People do not pay much to such folk healer. In many cases, women migrate as an adaptation strategy. Migration for employment increases after flood, when people move out of areas with job deficits in search of work. Female migration, mostly contributes a major share of the informal urban labor market. The major activities that employ women in urban areas include serving as domestic help, brick breaking, sewing, jute bag making, ash selling, fish and vegetable vending, selling rice cakes and working in the Ready Made Garments industry. 38.13% women of Khorda Gajail village migrate after flood but 60.17% women migrate in Bil Nuruddinpur village. Only self labor is not enough for the flood affected family at this time. They take help from different sources. They Keep communications with Disaster Management Committee and volunteers and ask for their advice and help. They Keep Contact with Up Chairman and members or volunteers to rebuild damaged household if required. They try to know the location of the nearest medical team around their house and ask for help if required. For seed and small plant they contact with agriculture officer. They take relief from these sources. Flood behavior in their own zone: because of previous experiences the households know the potential depth and duration of a given type of flood in the surroundings of their house. Perceptions of their own spatial location in relation to flooding: determined by the household’s consciousness of the local variations in the topography of the zone in which their residence is built and the closeness to the paths of flooding. Awareness of their own levels of physical exposure: determined basically by the safety that the house inhabited can provide to the family members and belongings. Perceptions of their own socioeconomic capacity or resistance to absorb the progressive losses and impact caused by the succession of flood stages. Awareness of potential environmental problems in their area associated with the presence of pollutants, human and animal waste. Perceptions of the state of affairs for the whole community determined by the levels of dislocation experienced by other households in their own zone and the whole mouza.